Collect and showcase multiple intelligent web maps in one configurable application. The Esri Thematic Atlas Sample Application is a configurable web application that helps users display a collection of intelligent web maps. The atlas showcases ArcGIS Online web maps in a specific sequence and relationship, with a simple interface for nontechnical map consumers. 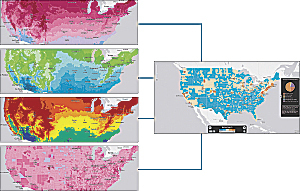 These thematic maps include pop-up windows with charts and other attribute information about populations, the climate, and more. The maps included in the atlas are designed to work with one another, each focusing on one part of a particular subject—for example, global development, health, or energy usage. The sequence of themes and maps allows users to move progressively through the map collection to look for patterns and explore countries, provinces, counties, and neighborhoods. The application greatly reduces the workload for the audience, dynamically adjusting the map and pop-up window from theme to theme. To start making your atlas, visit atlas.esri.com.